Located in Lozenets residential area, Apartment House Sofia offers serviced apartments with air conditioning and free WiFi. The property's spacious terrace offers scenic panoramic mountain and city views. Each of the apartments features a living area with a sofa, a flat-screen TV with cable channels, and a minibar. Guests can make use of the fully-equipped kitchenette. A designated dining area is provided. The bathroom is equipped with a bath, free toiletries and a hairdryer. A balcony is available as well. Apartment House Sofia boasts a restaurant with a garden. The Italian dishes on the menu are complemented by a wine selection. Room service is provided. Car rental and shuttle services are offered on request, at a surcharge. A 5-minute walk will take you to the Yuzhen Park. James Bourchier Subway Station is located 550 metres away. A grocery shop can be found in 200 metres from the Apartment House Sofia. When would you like to stay at Apartment House Sofia ? 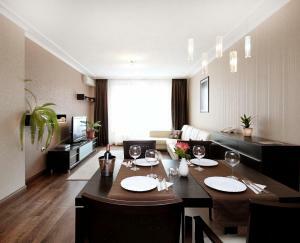 Each day we'll check prices and send you an email for your selected dates at Apartment House Sofia. If you don't have specific dates but would like to check prices for say next weekend or say next month we can check the price too. Click to write a review and share your experience of Apartment House Sofia with other travellers.